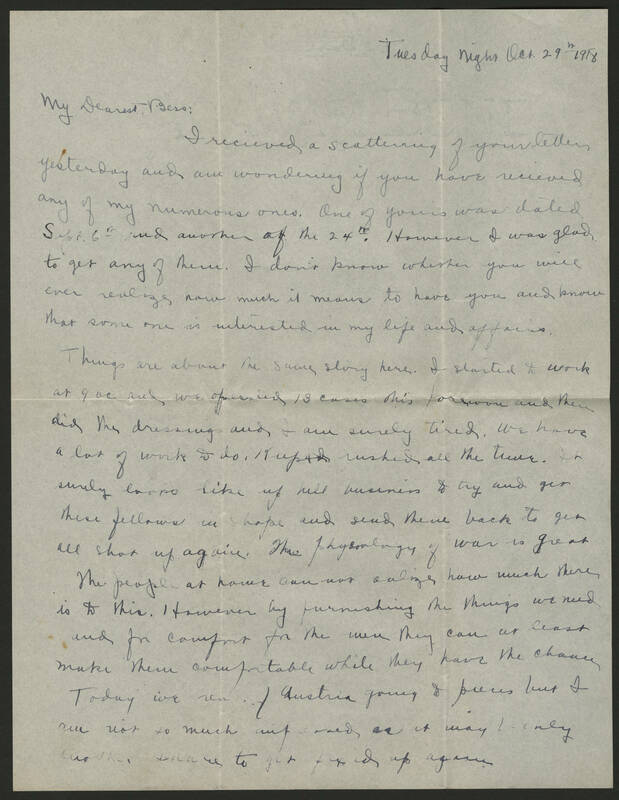 Tuesday night Oct. 29th 1918 My Dearest Bess: i received a scattering of your letters yesterday and am wondering if you have recieved any of my numerous ones. one of your was dated Sept. 6th and another of the 24th. However I was glad to get any of them. I don't know whether you will ever realize how much it means to have you and know that some one is interested in my life and affairs. Things are about the same story here. I started to work at 9 oc and we operated 13 cases this forenoon and then did the dressings and I am surely tired. We have a lot of work to do. [Kept?] rushed all the time. It surely looks like up hill business to try and get these fellows in shape and send them back to get all shot up again. The physiology of war is great. The people at home can not realize how much there is to this. However by furnishing the things we need and for comfort for the men they can at least make them comfortable while they have the chance. Today we read of Austria going to pieces but I am not to much [impressed?] as it may [be?] only another [illegible] to get fixed up again.